The beautiful new District 6110 Office, a wonderful resource for our district, is now on 63rd Place in Tulsa just off South Memorial Drive. If you happen to be in the area, stop by and take a tour of the office and say hello to District Administrator Rachelle Parker and Accounting Assistant Pat Phillips. 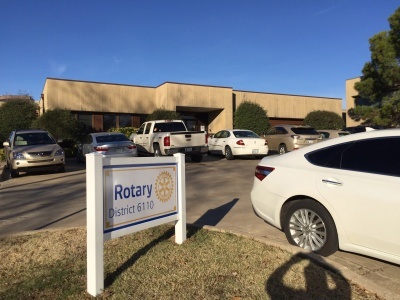 The office has multiple meeting spaces including a large conference room and private offices that are available for use by Rotarian's and Rotary clubs. If you are interested in reserving a meeting space please send an email to Rachelle Parker at rotarydistrictoffice@gmail.com. Please refer to the Building and Equipment Use Policy and the District Office Facilities Agreement. (Just off South Memorial Drive and East 63rd Place). Monday & Friday 8 a.m.-12 p.m. Tuesday-Thursday 8 a.m.-5 p.m.
A large meeting room, 25’ x 31’ (775 square feet) can accommodate up to 50 people with various options for room set up. The large conference room is a perfect place for visioning events and club leadership / committee chair training. There are two 42” flat screen televisions and a 7’ x 18’ projection wall, suitable for your PowerPoint presentations. The large meeting room is being used for all kinds of purposes. For example, some local clubs hold board meetings at the District Office. The big room is a perfect place for club visioning. The Council of PDGs (past District Governors) now hold their annual meeting at the facility. Eventually the space will be used for social functions, education seminars, and much more. Upon prior notification, either the large or the small conference room may be set up with a conference type speakerphone for audio or visual teleconferencing. 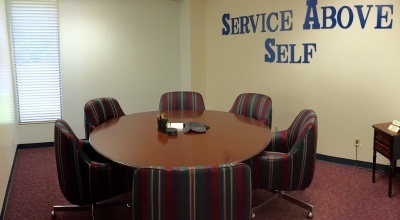 The smaller “Service Above Self” conference room will comfortably accommodate up to 6 persons at a round conference table with comfortable conference chairs. Other chairs can be added around the walls. Presentations may be projected upon the white-board in that room.